Originally found in Papua New Guinea and Australia, this turtle also goes by the name of Red Belly Sideneck Turtle. As the name suggests, the species typically has a red-pink belly with a grey shell and a breastplate of grey-coral pink. There are two yellow stripes on the neck with heads typically colored green and grey. Usually hatching at 1.25 inches in length, the species can grow up to 10 inches after a decade. Distinguishing the sexes can be done when the turtle is roughly 5 inches in length – males typically have thicker tails while females have shorter and slighter tails. They are considered favorites in the turtle world because of their beautiful shell and their even temperament. The Pink Belly Sideneck Turtle is known for its ability to adapt with other turtle species. However, they are averse to both Snap Turtles and Large Musk Turtles. It is estimated that the breed can live up to 50 years. 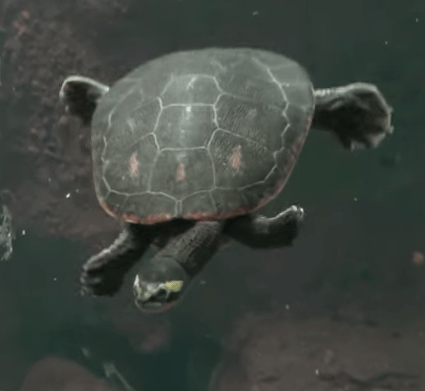 Turtles will enjoy sufficient "hiding" space underwater. The presence of plants, logs, and other aquarium designs will be most welcome. Make sure that there is sufficient space to prevent these turtles from getting stuck. Adjusting the placement as they grow is recommended to provide sufficient underwater hiding space. The rule of thumb is that a 4-inch turtle should be kept in a 20-gallon tank. Every inch beyond the 4-inch measurement should be equal to a 10-gallon size addition to the tank. If you have more than one, increase the ideal size by 10 to 15 percent. The Pink Belly Sideneck Turtle is carnivorous, which means that you can feed it pretty much anything. Most owners offer turtle pellets to the breed although they also accept fish and other seafood, with the exception of shrimp. It is believed that in the wild, the turtle feeds on mollusks. Feeding time can be done three or four times a week, at a schedule you find convenient. Originally rare, the Pink Belly Sideneck Turtle has been successfully bred in captivity, hence the strong supply of the species in the market. Like all other turtles, the pink belly digs holes to bury their eggs inside. Breeders can let the eggs hatch naturally or use an incubator for safety and to speed up the process. This particular turtle requires a specific environment in order to thrive. It enjoys both deep water tanks and shallow ones, depending on your preferences. Deep water tanks, however, will let you better enjoy the array of colors of the turtle. Sunlight is the best source of basking heat for these turtles, but if this is not possible, UVB light will be enough. All turtles enjoy a good round of basking, so provide sufficient space for the activity even though the breed is technically not a basking type. Provide UVB light producing heat of around 90 degrees. Water temperature should be kept between 66 to 80 degrees Fahrenheit. Thanks to their adaptability, the turtles can live in mildly chlorinated water or tap water considered safe for drinking.